Gopher apple (Licania michauxii) is a low growing plant that produces a fleshy edible fruit. The plant regenerates well after fires and can be found in dry upland areas frequented by gopher tortoises. 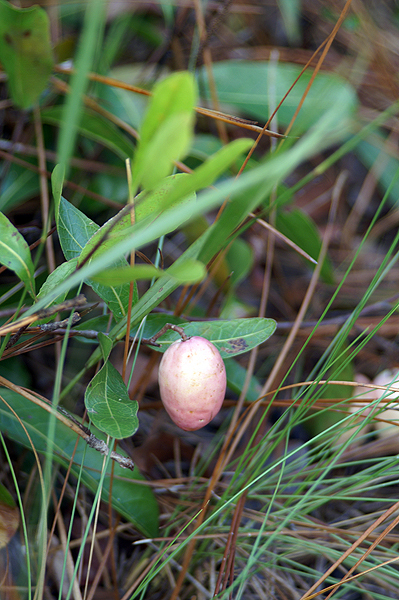 The fruit is a favorite of the gopher tortoise, hence the name, gopher apple. Other wildlife also like the fruit, which is also edible for humans. It is rather sweet and pleasant tasting. This entry was posted on Wednesday, July 18th, 2012 at 4:00 pm. It is filed under Environment, New Images and tagged with forest, fruit, Gopher apple, Licania michauxii, pink, plant. You can follow any responses to this entry through the RSS 2.0 feed.